Hopefully many of you that read my blog will have missed reading it as much as I have missed writing it. However, since this is a specific time of year where we all count our blessings, I will keep this blog post short but will try to be more frequent with my posts as I have a lot to say after returning from such a wonderful trip. Well we are back and first off let me say that the 50 day trip was fantastic. Some interesting times as well as finding ourselves in unusual situations we never in our wildest dreams thought we would find ourselves in but the cool part of this adventure was that we made it through and our friendship with the other couple that shared the adventure is still intact. Why do I interject this little piece of information? Because we met a couple on the voyage over from New York to Southampton, England, that upon learning of our quest (the four of us were crossing the Atlantic via the Queen Mary II, renting a car in London, touring England for a week, going to Paris via the Chunnel where we would spend a few days before touring nine other countries via car ending up in Barcelona, Spain where we were to board another transatlantic cruise home to Miami, FL where we were to board a plane back to Tampa and subsequently Lakeland, FL), said she would love to be at the other end of this fantastic voyage to see if the four of us were still talking. Fact-of-the-matter is that not only are we still talking but still laugh when we get together to reminisce about some of the wild and crazy things we did during this adventure. Future articles will not only provide you with stories about this memorable trip but I hope to interject little tidbits of information regarding 2012 now that it is coming to an end as well as what objectives and goals I am considering implementing for 2013. Last year I actually made a list of New Year’s resolutions but find that I did not complete many of them. Instead, this year I am going to think first what I am hoping to accomplish in 2013 and then, instead of listing New Year’s resolutions, I am going to create a plan on how I intend to reach those goals. Comments for I am back once again to share a story or two! 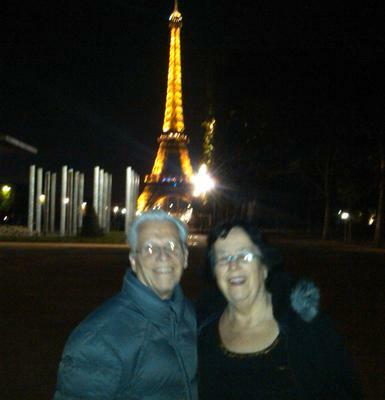 Thank you Judy, Ed, and Felice for your comments on our recent escapade in Europe. Judy: the trip was such a wondrous one - one that never in my wildest dreams did I ever think I would make. One would have to go back to my beginnings to understand where I am coming from. But, to have stood near the Eiffel Tower and to ride the London Eye as well as cross the English Channel via the Chunnel, not to mention all the wonderful sites we seen, it is mind-boggling. We are still trying to sort pictures and put our notes together regarding the various places we visited. As soon as I can make some sort of semblance of what we seen and when we seen it, you can be sure I will be sharing some of our adventures with you. Thanks for staying tuned. Ed: Let me start out by saying we began planning the European adventure as I would like to call it in Jan 2012 and made it a reality in October 2012. We did all the planning and setting of sites to see, places to stay, transportation and so forth ourselves. Was it costly - by some standards yes - but when one looks at all we did and for the amount of time we were gone - I would say we were very frugal. As to sharing with you the costs of such a trip I haven't done all the tabulations yet but I do have a rough idea as to what it cost us per day. I believe there is a way that Wendy can provide me with your email address and we can correspond accordingly regarding your request. It can be done without costing an arm and a leg, so to speak. Felice: Thank you for your kind words and Wendy has provided me with your email address and so be on the watch for an email from me so that we might become "pen pals" so to speak as while I am looking forward to sharing our escapades with you, I am likewise looking forward to possibly getting some tips from you (since you have lived overseas and traveled to places we probably haven't) as we now have the bug to do more while we can. Thanks to each of you for following my escapades and I hope to post more pictures with little vignettes of our escapades in future days. So stay tuned. Glad you had a wonderful trip, and good to see you back. I am looking forward to reading about all your adventures! looking forward to hearing more about your trip. Sounds fantastic. Would you share what it would cost to make a trip like this? I would like to do the same thing. I love to travel, and your trip was all I needed to start planning. Read your well written message with great interest. Having lived overseas and travelled widely, I would be interested in corresponding with you and your wife. You both look like the same ages as my husband and I. Love to talk travel and explore other cultures.